The New Humanitarian | All at sea: what lies behind Southeast Asia’s migrant crisis? The majority are Rohingya Muslims, described as one of the most persecuted minorities in the world. About 800,000 live in Myanmar’s western Rakhine state, including about 140,000 in government-built camps built to separate ethnic Rakhine Buddhists and Rohingya after several bouts of communal violence. The government of Myanmar has denied the Rohingya citizenship, restricted their freedom of movement, access to education and right to vote, claiming they are not a genuine ethnic group but Bengali migrants. 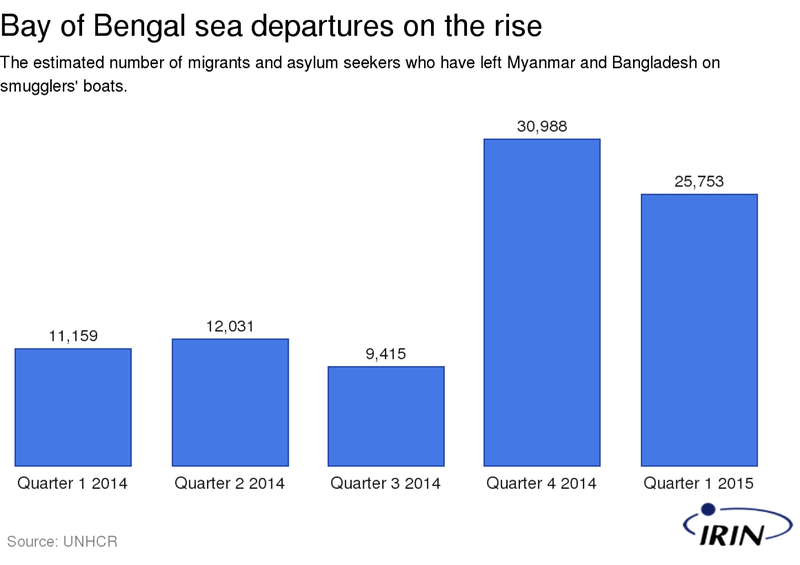 According the UN refugee agency, UNHCR, 25,000 departed the Bay of Bengal on smugglers’ boats in the first three months of 2015. See: Briefing: Myanmar’s “Rohingya” – what’s in a name? Where are they trying to go? Most are hoping to reach Malaysia, a Muslim country with some demand for unskilled labour and where many Rohingya already have relatives. Malaysia is not a signatory to the UN Refugee Convention and refugee cards issued by UNHCR come with few benefits. Considered illegal immigrants, the best they can hope for is to find informal work and avoid detection and detention by the police. How do the smuggling rings work? Boats depart from both Myanmar and Bangladesh - where about 200,000 Rohingya live in refugee camps. Passengers are usually offered a low price of a few hundred dollars or even free passage on the understanding they will pay for the journey from their earnings in Malaysia. In reality, they or their family are usually forced to pay much larger amounts in return for their release from smugglers’ camps near Thailand’s border with Malaysia or, increasingly, from the boats themselves. UNHCR estimates that 300 migrants died at sea in the first quarter of 2015 while an unknown number have died in the camps. The Thai authorities recently discovered mass graves containing at least 30 bodies at one such abandoned camp. UNHCR’s interviews with survivors suggest the trafficking networks are regionally diverse and multi-cultural – involving Bangladeshis, Thais, and Burmese including Rohingya. What triggered the current crisis? Ironically, it seems to have been action take by Thailand to crack down following the discovery of the mass graves. Thailand could face sanctions if it does not improve its low ranking in an annual human trafficking report compiled by the US state department. Following some high-profile arrests, including several Thai officials, smugglers have abandoned their boats at sea, along with their human cargo, rather than risk trying to come ashore. In recent days, authorities in Thailand, Malaysia and Indonesia have said they will not allow the boats to land and have turned away several boatloads of migrants. Reporters located a boat containing 350 mostly Rohingya migrants drifting a short distance from the Thai coast on Thursday. The Thai navy later air dropped some food next to the boat and repaired its engine so that it could continue on to Malaysia after the passengers reportedly refused an offer to be disembarked on humanitarian grounds. Indonesian fishermen brought nearly 800 migrants ashore on Friday after spotting their boat sinking off the eastern coast of Aceh province. What are regional leaders saying? Earlier this week, Thailand’s Prime Minister Prayut Chan-o-cha said his government lacked the resources to absorb more migrants, but on Thursday he told journalists he had ordered an evaluation of two unpopulated islands off the west coast of Ranong province that could be used to temporarily detain the stranded Rohingya. Thailand has also called for a regional meeting to be held on 29 May to find a solution to the crisis. In a statement issued on Friday, Malaysia’s prime minister, Najib Razak, said he was “very concerned with the plight of migrants in our region”. Government leaders in Myanmar have largely remained silent on the issue except to say that they would likely boycott the proposed regional meeting. “We do not accept if they [Thailand] are inviting us just to ease the pressure they are facing,” presidential office director Zaw Htay told AFP. 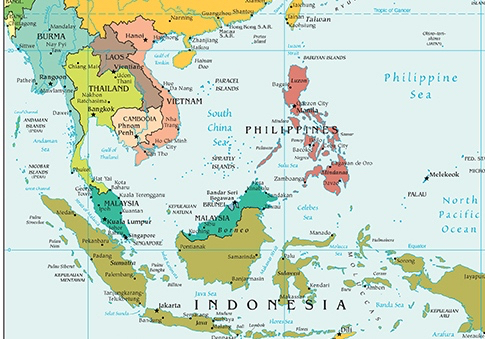 The Association of South-East Asian States (ASEAN) could lead a regional solution. But the grouping is notoriously leery of interfering in the affairs of member states and has proved itself unwilling or unable to exert pressure on the government of Myanmar to reform its policies towards the Rohingya – the root cause of the exodus. Within Myanmar there is little appetite for championing the rights of the Rohingya, particularly during a crucial election year that has seen a surge of Buddhist nationalism. Even renowned human rights advocate, Aung San Suu Kyi has been silent on the issue. There have also been suggestions that Australia should show leadership. But Australia’s own policy of turning back boats carrying asylum seekers and refusing to resettle even those who make it as far as Indonesia means it has largely lost credibility on the issue. What has been the humanitarian response? Both UNHCR and the International Organisation for Migration (IOM) have been providing humanitarian aid to the several thousand migrants and asylum seekers who have made it ashore to Indonesia’s Aceh Province and Malaysia’s Langkawi Island in the last week. “I appeal to the governments, and all who can help, to find these boats and let the migrants land and get medical treatment,” said IOM Director General William Lacy Swing. “We will assist you in resolving the longer-term problems of accommodation, transport home for some, and other options, but in the name of humanity, let these migrants land,” he said. UNHCR has pointed out that countries in the region have a moral imperative and a legal obligation to rescue people in distress at sea according to international maritime law.